Recommended citation: MicInnis-Misenor, Kathy Oral History Interview, July 14, 2014 by by Keith Ludden, Page #, Oral History and Folklife Research. Online: https://www.oralhistoryandfolklife.org/wp-content/uploads/2014/12/McInnis-Transcript-3.pdf. Description: Kathy McInnis Misenor was born December 24, 1958. 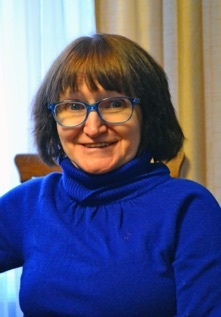 She has been active in local politics in Saco, ME, and worked extensively as an advocate for disability rights during the period in which the Americans With Disabilities act was made law. MCINNIS-MISENOR: …And we sat there and we said, I said, “But Mom–” And she said, “No buts! For five minutes take a deep breath; look at each other, look at the dream. You went from early 20’s rabble rouser types to leaders of a movement that has changed this nation and will change this world.” And there we were stupidly, crying like babies. NARR: Kathy McInnis Misenor was among those who had a front row seat watching the Americans with Disabilities Act become law. McInnis was born in 1958 and has fought rheumatoid arthritis since she was five years old. She could walk until she was eight or nine years old , but by twelve years old, she was using a wheelchair. But the wheelchair didn’t take the fight out of McInnis, who hails from a long standing Irish activist family. Her great grandfather, Francis Patrick Murphy once stared down the Klan in Saco. One of McInnis’ first battles was a campaign for Saco city council in 1980. MCINNIS-MISENOR: There were several councilors that were just outrageous, calling me mentally unstable, mentally retarded–”She shouldn’t have run if she couldn’t get into the building.” “It’s not a place for them.” …But I did win. they did have to renovate a downstairs room to be accessible, and then make a plan to make the entire city hall accessible. NARR: In the early 1980’s McInnis worked with the newly formed Maine Association of Handicapped Persons and turned her attention to the issue of accessible transportation in Portland and South Portland. Portland and South Portland have paratransit busses, but they are only available on 72 hours notice for medical appointments. MCINNIS-MISENOR: We had tried to educate people around accessible transportation way before any lawsuits were filed. So we did a series of public forums and invited everybody, including Senator Mitchell, town officials, and basically said, “You need to come and hear why this is cost effective. NARR: And she says, there was a lot of foot dragging on the issue, with officials offering only limited service, instead of fitting all of the busses for accessibility, a compromise the Association rejected. MCINNIS-MISENOR: We decided that if they chose to order them inaccessible we would do massive protests. And of course they were going to come on line in January (laughs). So we decided this will be interesting. These are brand new inaccessible busses. They are advertising everywhere for ads on the busses. So we bought ads on the busses. It said, “If you can’t walk, you can’t ride.” And then they thought, well, that’s it, but it wasn’t. The day the busses rolled, those that had crutches, or whatever took their sweet time walking up onto the bus, and saying, “Oh, I was going to go to the mall today, but since my friend Kathy can’t get on the bus, I don’t think I am.” And then taking their sweet time to get off. NARR: In August of 1984, Maine Superior Court Judge Donald Alexander ordered Portland and South Portland to either buy accessible busses or retrofit their busses to accommodate persons with disabilities. McInnis remembers her first ride on one of those busses. MCINNIS-MISENOR: And so we arranged we would go up shopping. So we did that, and she’s sitting on the bus, but it wasn’t literally ‘til I got to the store and I was shopping that I realized, “My God, I can do this all the time now at a half hour–you know, not even call, not a notice.” Because the paratransit was 72 hours in advance, and only to medical appointments. NARR: Maine was the first state to declare access to transportation a civil right. MCINNIS-MISENOR: Boy, the calls we got the day of that decision! From every state in the union; from foreign countries, and operators trying to translate, and–it was wonderful and crazy all at the same time. The efforts in Portland and South Portland were a ground breaking effort by the Maine Association of Handicapped Persons to push for accessible transportation–an issue that had become the target of protests nationally. Later, the Maine Association of Handicapped Persons joined Americans Disabled for Accessible Public Transportation and a coalition of disability rights groups in suing the Department of Transportation in the U.S. Third Circuit Court of Appeals to force implementation of regulations mandating accessible transportation. MCINNIS-MISENOR:–and we won! And they caved (laughs). Department of Justice, Department of Transit, they caved– big time caved! And so they were forced to issue the regulations that mandated all new busses be accessible. NARR: In May of 1990, debate on the Americans With Disabilities Act began in the U.S. House of Representatives. Then, finally, the House came to a vote on the legislation. MCINNIS-MISENOR: And then the roll call was starting to take, and you would see the lights, and once it hit the magic number, which we all know for passage, there was this (gasp). “Is it gonna hit? Make it sure. And suddenly it passes, and you could see some of the congresspeople, the representatives that worked on it just starting to get emotional, but they’re silent and going, “Oh my God!” And then there was this sigh through all of us and then within seconds, just roaring applause. Doors were flying open! And I’m saying, “Get out, get out, get out! Let other people come in and see this while the board is still lit up. Let them see it!” So I get out, and Orrin Hatch is running down the hall and he says, “What happened? What happened?” And I said, “They passed it!” And that was amazing, that day. And I said, “I have to call my mom.” And the only place to call here was an inaccessible phone booth right there, outside of the House gallery. So I had my friend, who is a little person–she has to get inside and she has to, with my help, jump up on the seat, to get the phone down for me and dial the number. NARR: From there, it was on to the Senate. A controversial amendment delayed the vote on the bill for weeks, and there was tough opposition from North Carolina Senator Jesse Helms, but when the votes were counted, disability rights activists had won another victory. MCINNIS-MISENOR: The cheers were so deafening that the walls–which the space there, the sound is incredible–were just reverberating and the whole room felt like it was vibrating and lifting up. And then Steny Hoyer was there, and Orrin Hatch came out–both of which have family members with disabilities–and they came out and they were saying that we did it. And they began to say how we taught them a lesson about how things could be done. NARR: It wasn’t perfect, but disability rights activists had gotten what they most wanted. MCINNIS-MISENOR: Whe had civil rights! They couldn’t throw me out of the Faneuil Hall store they threw me out of when I was a teenager because I might break something, you know. NARR: I’m Keith Ludden. Our series on the 25th anniversary of the Americans With Disabilities Act is funded in part by the Maine Humanities Council, in Partnership with the Maine Arts Council, Oral History and Folklife Research, Alpha One Independent Living Center, WMPG, and the Disability Rights Center of Maine.